What Makes The Best Crow Scarers? Before you initiate ‘bird or crow scarers’ to keep the pest birds away, it is important to have information about your problem, and do research. Sometimes in your garden or on your property, you will have a problem with only one species of bird. This means that you can target that type of bird in your bird scaring defense and make it a lot more effective. Some birds respond better to different types of scarers, so it is good to know what your pest problem requires so you can have a greater effect with your effort. Crows are one of the first birds that farmers wanted to scare away from their crops. As simple as it sounds, ‘scarecrows’ got their name because corn farmers would erect imitation people in their corn fields to keep the crows away, as crows do eat a lot of corn. Scarecrows are still mostly seen in farms and other crop farming places, but now are popular additions to the back yard vegie patch and garden. Our knowledge of birds such as the crow is getting better. To control a pest such as the crow (which has been around the block a few times) will take some thought, rather than just sticking a random scare crow in a field. Birds such as crows have a lot of time to sit and wait, getting closer and closer to the thing they want, all the time becoming more comfortable with the bird scarer, so ‘crow scarers’ need to be better equipped to handle and stay on top of pest problems. Crows are also quite opportunist which means they look for easy opportunities like open rubbish bins, roadkill and unprotected seeds and plants that they like to eat. They will eat almost anything edible so removing these opportunities is a good start to keeping crows away from your property. Crows are quite socialble within their own circles and don’t act as individuals. This means that you will always be dealing with more than one crow, which will be associating with others. They can gather with many other crows to sleep and share food. Crows are known to migrate, but may only migrate a few kilometres away, so just because the crows leave, doesn’t mean they wont be back next year! Owls, hawks and humans are the natural predators of crows, and imitation ‘crow scarers’ such as plastic owls, imitation hawks and scarecrows do have an effect on keeping crows away. Domestic pets, and especially cats are predators of crows, if you are really trying to get on top of your crow problem then you could borrow a cat. When crows nest together it is called a roosting, which is typically done in a tree. If you have a large property and crows start roosting in your tree the only way to get rid of them might be to cut it down, as they will ruin the tree and go close to killing it anyway. 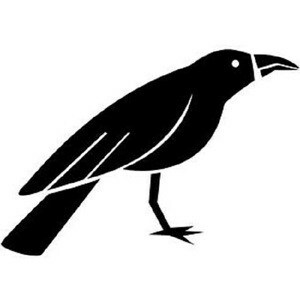 Crows also do not like new or odd. What this means is that changing something, even just a little bit can help keep them away from your property. Crows are known to vandalise property in rare cases. No one knows why they do this but it can be very frustrating for property owners, and the best solution is to use or make crow scarers and keep them away from their target. I hope this information helps you with your problem crows.